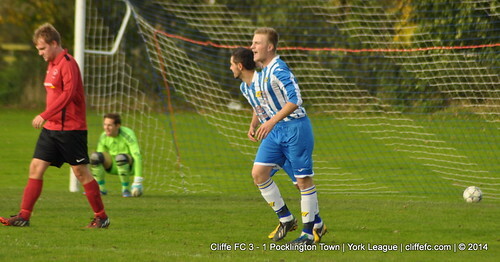 Cliffe FC earn their first league win of the season featuring a dominant first half performance in a 3-1 win over Pocklington Town. For the first time since 2012, Keith Tiplady was absent from a Cliffe FC league game as a combination of Luke Durham and Malcolm Bryce took stand-in charge. The stand-in management wanted to deliver all three points and named an attacking side in a 4-3-3 formation. Cliffe’s dominant first-half performance meant Pocklington were reduced to counter-attacked as Cliffe’s 4-3-3 formation was supplemented well with full-backs Kev Taylor and Reuben Pearse bombing on to give Cliffe added width going forward. Cliffe took the lead near the fifteen minute mark, a bit of twin magic saw Darren Jackson assist his brother Chris Jackson who’s chest and volley finish opened the scoring, 1-0. Tom Grundy came close with a long range effort, his blasted shot just going over the bar. Goalscorer Chris then turned provider when his cross was met by débutante Dean Wood controlling and smashing the ball past the ‘keeper for 2-0. 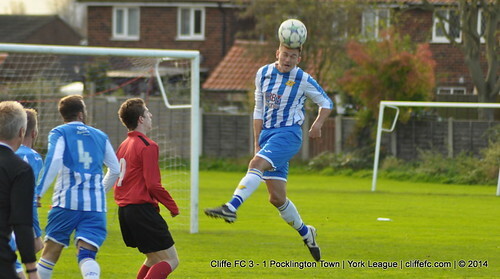 Pocklington’s attacks were generally snuffed out by centre-back pair Darren Jackson and Tom Hogg. Wood then doubled his goal tally, pouncing on a defensive error and sliding the ball under the ‘keeper to make it 3-0. Cliffe fully deserved their lead at the break, the scoreline 3-0. Pocklington seemingly re-shuffled their formation as the second half went on, and whilst having more men in the middle of the park – Andy Addison, Tom Robinson and Jack Dinnewell continued to compete well for Cliffe. Durham and Bryce didn’t want to change team shape and introduced both Nigel Horner and Nathan Leach. Horner had a chance go by as a nodded down Taylor header at the back post, the ball just evaded Horner in front of goal. A bit of petulance crept into Cliffe’s performance as they picked up a string of bookings, Cliffe maybe needing to change shape to cope with Pocklington’s pressure. Cliffe’s final substitution saw the reintroduction of Luke Durham to football action, the stand-in manager leaving Bryce on the touchline solo for the final minutes – his first action since his knee injury in April. Pocklington scored in the final few minutes, what would only be a consolation, a goal that had being coming since the half-time break – Dave Laverack unlucky to see a clean sheet evade him in the last few minutes of the match – but Cliffe saw out stoppage-time – a well deserved three points for everyone involved – 3-1 FT.
Cliffe notch their first league win of the season with lots of positives to work with. Also good to see Chris Jackson grab his first goal since his return, Luke Durham’s short cameo and Dean Wood scoring a brace on his début. Next Saturday sees Cliffe FC first team with a free week – Their next game is a week on Saturday; Saturday 8th November at home to F1 Racing in County Cup. Cliffe FC Reserves are back in action next Saturday, they are in County Cup action away to Langtoft AFC. The New Inn Cliffe FC MOTM: Dean Wood. Laverack, Taylor, Pearse (C), Hogg, D Jackson, Dinnewell, Robinson, Addison (N Leach), Wood (Durham), T Grundy (Ni Horner), C Jackson. Cliffe FC Goals: Wood (2), C Jackson.